We would like to remind you of the upcoming collection schedule and inclement weather policies. 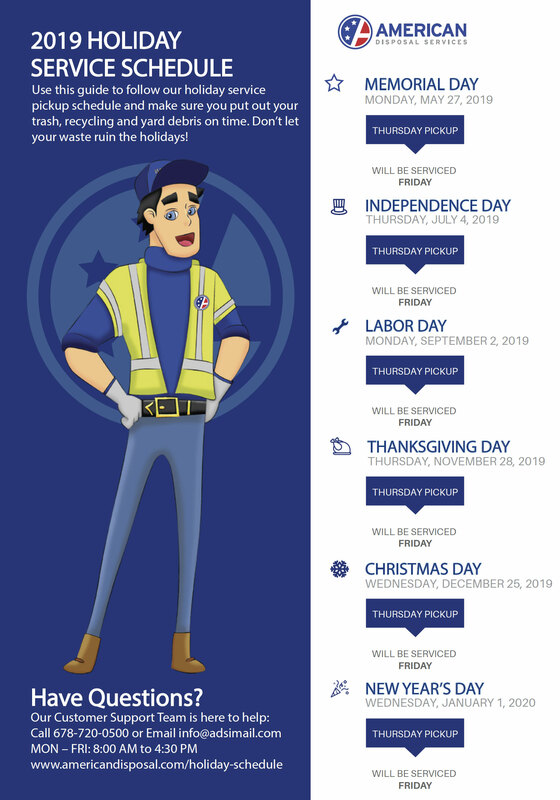 American Disposal is closed for Memorial Day, Independence Day, Labor Day, Thanksgiving Day, Christmas Day, and New Year’s Day. Memorial Day: Trash pickup will be moved to Friday so place your trash at the curb Thursday evening. Independence Day: Trash pickup will be moved to Friday so place your trash at the curb Thursday evening. Labor Day: Trash pickup will be moved to Friday so place your trash at the curb Thursday evening. Thanksgiving Day: American Disposal Service will be closed and NO service will be provided. Collection for our neighborhood, which is normally scheduled for Thursday, will be delayed by one day and will be collected on Friday. Christmas Day & New Year’s Day: Both fall on Tuesday this year. American Disposal Service will be closed and NO service will be provided. Collection will be on a one-day delay. So collection for our neighborhood will be on Friday. Christmas Tree Collection: Christmas trees will be collected on our regular collection day. PLEASE remove all tinsel and decorations. Please DO NOT place trees in plastic bags. NOTE: on make-up days, crew will come through neighborhoods earlier than normal. PLEASE make sure waste & recycle containers are to curbside the night before. Inclement Weather: Safety in our community is a primary concern. Roads and/or areas that are deemed unsafe due to snow or ice will be suspended for collection. If suspension occurs, service will resume on the next regular scheduled collection day. Please feel free to call American Disposal Service customer service (no account number needed) at 678-720-0500 Monday through Friday from 8am to 4:30pm or visit their website at www.americandisposal.com. Waste Management will no longer provide residential services in Cobb County. Therefore, American Disposal Services (ADS), will continue to provide the same services at the agreed upon rates. The existing equipment, carts, bins, etc. will stay in place and ADS will empty them weekly. Pick up day is Thursday, starting April 6th. Go to their website by clicking here. NOTE: Per our Covenants and Restrictions for “solid waste to be disposed of by being collected on a regular and recurring basis, containers may be placed on each Owner’s Lot on any day that a pick-up is to be made.” Therefore, in the interest of keeping our neighborhood beautiful please put your containers out either the morning of the scheduled pick up or at the earliest after sundown the night before. At the HRHOA Annual meeting in October 2015 the neighborhood overwhelming selected a single household and yard waste service provider to increase safety by decreasing traffic and saving money. Through a competitive bidding process Waste Management (WM) has been selected as the only provider of these services to our members. Glass recycling was discontinued on June 1, 2016: click here. If you need further assistance call Waste Management at (404) 794-6707. Beginning Monday, January 4th, Waste Management (WM) will begin once weekly trash, recycling and yard waste services for the entire community. We ask that all trash and recycling be placed curbside by 6:00 a.m. every Monday to ensure collection. On holidays, WM will service one day behind the normal service day. Their service guidelines are attached for your review. Waste Management will provide each resident with one 96-gallon rolling cart and one 65-gallon recycling cart. Existing WM customers who wish to exchange their smaller 18-gallon bin may do so by calling their customer service department at (404) 794-6707. Please reference that you live at Highland Ridge. WM will collect up to eight (8) additional bags of trash and/or yard waste on your service day at NO ADDITIONAL COST. WM will provide once-yearly curbside bulk pick up FREE of charge. Your HOA will schedule this community event. WM will offer FREE Christmas tree pick-up for two weeks following Christmas. Please note: trees must be cut in half for disposal purposes. WM will provide FREE trash and recycling services to your pool/clubhouse. Once your service is established, please contact WM at (404) 794-6707 with any customer service related issues. If your issue is not resolved to your satisfaction, please contact your board at hrhoa-minfo@highlandridgehoa.org for further assistance. If you additional questions that have not been found here, on the Waste Management website, www.wm.com, or by calling their customer service department at (404) 794-6707 please email Waste Management Information.